Arasan Chip Systems, the leading provider of MIPI Camera and Display IP Solutions, announces support for MIPI DSI v1.3 with support for Display Stream Compression, Sub links, Deskew, and Checksum for Test Mode. DSI v1.3 adds support for deskew and sublinks for multiple DSI drivers per panel with “sub links” which provide clock synchronization for multiple DSI receivers (drivers). DSI v1.3 is backward compatible with DSI v1.2 which introduced vendor-supplied compression encoder / decoder schemes. Both DSI Tx IP Core and DSI Rx IP Core compliant to the MIPI DSI v1.3 Specification are available immediately. Arasan is also preparing for the production release of DSI-2 in early 2016, adding support for MIPI C-PHY. Arasan introduced C-PHY and the industry’s only C-PHY/D-PHY combination in February 2015. 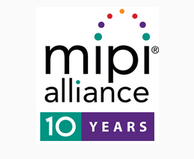 “Our latest DSI v1.3 update extends our 10 year support for MIPI Camera and Display IP for the next generation of high resolution cameras and displays. Our DSI IP in combination with our DPHY IP offers early adopters the fastest time to market while ensuring compliance.” said Chari Santhanam, Vice President Engineering, Arasan Chip Systems. Arasan’s MIPI DSI IP Core compliant to the MIPI DSI v1.3 Specification is seamlessly integrated with its MIPI DPHY compliant to the latest MIPI DPHY v1.2 Specification supporting speeds of up to 2.5GHz. Arasan which announced it’s first DPHY IP Core in 2007 has the Industry's broadest portfolio of DPHY IP with over 19 nodes on 5 foundries from 180nm to 28nm, including multiple automotive grade nodes. “Arasan specializes in porting it’s DPHY, but with such a broad portfolio, chances are we have it Silicon Proven off the shelf.” added Ron Mabry VP of Sales at Arasan. The Total MIPI DSI v1.3 IP Solution includes DSI-2 v1.3 transmitter and receiver controllers, the D-PHY v1.2 combination physical interface, and support services. All IP components are available for immediate orders. Arasan’s D-PHY is available in a wide range of silicon-proven foundry process nodes from 180nm to 28nm. Please contact Sales(at)Arasan(dot)com for additional information.